It’s warm enough to swim but the water is too cold – What to do? The object of owning a pool is to swim and enjoy being out around your pool, taking a dip and not freezing. 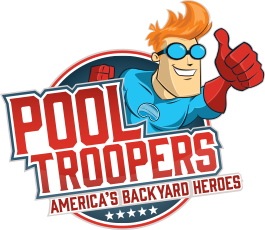 It’s time to heat your pool, and Pool Troopers can help. We sell the top-rated Pool Heaters, Heat Pumps, and Gas Heaters in the industry. Heat Pumps are the clear choice to heat your pool. Because of mild winters and early springs, you can usually extend the swim season two months and begin it two months early. They are the most efficient at slowly heating large bodies of water and keeping them at temperature over time. We sell only top-rated Heat Pumps with industry-leading Coefficients of Performance. In addition to heating pools, the best heat pumps will reverse cycle and cool your pool in the dog days of summer, enhancing your swimming experience. Look for COP’s of over 5 with heat pumps. COP translates this way -if you put in one dollar of energy you get the unit’s COP back out in heat. So, a heat pump with a 5.5 COP will give you $5.50 worth of heat for every dollar in electricity- slowly. Gas Pool Heaters, whether Natural gas or Propane, are the best choice to heat a spa. In our, over 60 years of experience we have come across two consistent truths with spas. 1. If Spas are hard to use you won’t use them. 2. If Spas take too long to heat you won’t use them. That is why we recommend automation and gas heat. Gas Heat is the fastest way to heat a small body of water like a spa, and automation to change your valves keeps you from climbing into the bushes to do it- you know you don’t like to do that. Our informal survey finds clients use their spas 5 times more often after we add automation and 10 times more often when using a gas heater and automation for the spa instead of their old dual thermostat heat pump. Gas heaters are typically too expensive to use to heat a large body of water such as a pool because their COP’s are less than one. A good gas heater has a COP of .78, a great one has a COP of .85, and the best approach .95. Why use them…because they heat fast, so only use them for small bodies of water- spas. If it costs too much – you won’t! What if I have a pool and spa combo? You need both a gas heater and a heat pump. Gas for the spa and the electric heat pump for the pool. It’s a “use the right tool for the right job” kind of thing. For the reasons above gas is best for small bodies of water – spas, and heat pumps are very efficient at heating large bodies of water over time- pools. I don’t use my spa because it takes too long to heat up. How can I fix that? Spa use is a health benefit and our job is to help you get in it more so you need two things- fast efficient gas heat, and automation.